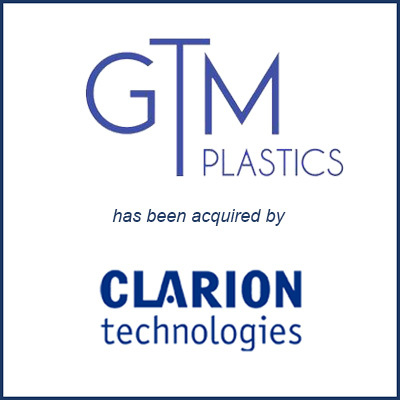 Garland, TX – October 2017 – Clarion Technologies has recently acquired the assets of GTM Plastics. GTM, based in Garland, Texas, voluntarily filed for bankruptcy in early 2017. Clarion bought the assets of GTM under provision 363. GTM will be Clarion’s third production plant and the company operates facilities in Grand Rapids, MI; Anderson, SC; and now Garland, TX. The GTM location places Clarion in southwestern U.S. markets and closer to customers in Mexico. GTM brings clients in HVAC markets, a new area for Clarion. Clarion mainly manufactures injection molded components for automotive and appliance industries and also counts medical companies among its customer base. Molding Business Services acted as the exclusive financial advisor to GTM Plastics. Excerpts from above were taken from a Plastics News article published on October 5, 2017. Read the entire article.